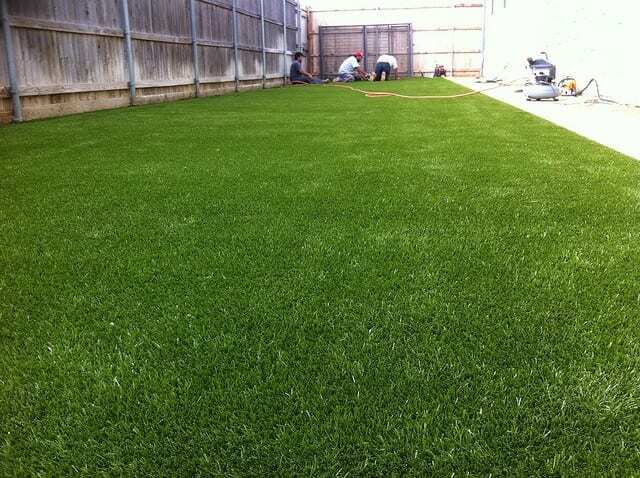 Installation is a critical component to an effective and successful K9Grass® solution. It isn’t just about appearance of the turf, it’s about performance. Dogs can find weak spots and expose failures quickly. Our proven installation techniques ensure your K9Grass installation will stand up to the dogs with secure edges and seams—not only looking the best, but performing well over time. Our experienced technicians understand that dogs are curious and like to pick at things. That is why we install a perimeter board as part of the base around the area to which the K9Grass is anchored. The grass is secured to the plastic board using stainless steel staples, plastic components, or specially crafted aluminum carpet strips, all of which hold up against urine. Allowing the fast, efficient, and directed exit of liquids is crucial. This is typically accomplished by using an aggregate that is drainable by design or a special grid product such as our proprietary AirGrid product. The drainage capability of K9Grass has been independently measured to be approximately 100 times that of typical turf (2,000–3,000 inches per hour versus 20–30 inches per hour). ForeverLawn has created and installed proven cutting edge solutions such as our patented Indoor Flushing System often used indoors. We offer multiple installation options, many of which are depicted here, along with architectural specs. View architectural specs here. A properly designed and implemented installation is key to maximizing the performance and longevity of our K9Grass solution. Leveraging the experience of ForeverLawn and our professional installation is advisable, but even do-it-yourselfers can benefit from consulting our trained professionals for advice on what approach works best. Our professionals approach each job with the utmost care to ensure your project is a success. Contact a local ForeverLawn Dealer to get started with your K9Grass installation.